Here is a pic from our last Flash get together, which took place on Monday 22nd May at The Red Lion in Cosham. 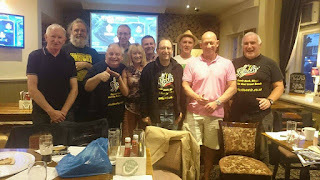 From left we have Roger Wilson, Kev Ellis, some bloke called Martin, Chris Rogers, Jill Stembridge, Rob Hyslop, Larry Oster, Mark Handley, The Magnificent Jonathan C, and Derek Pearce. A big thank you to Julie Pearce for taking this photo. It was a great evening, and the pizza was nice too!. — with Roger Wilson, Kev Ellis, Chris Rogers, Jill Stembridge, Robert Hyslop, Larry Oster,Mark Handley, Jonathan Hope and Derek Pearce.